Dr. Glenn Alers is currently President of Soliculture Inc. Prior to Soliculture, Dr. Alers was president of APV Research and provided photovoltaic reliability characterization services to the solar industry for 4 years. In 2009, Alers was a visiting scientist at the National Renewable Energy Laboratory (NREL) photovoltaic module reliability group. He has been an organizer and has given numerous tutorials on photovoltaics reliability for IEEE Reliability Physics Symposium, IEEE Integrated Reliability Workshop, SPIE Optics and Photonics and NREL PV Reliability Workshop. Prior to working on photovoltaic reliability, he was a principal engineer and senior process manager at Novellus Systems working on integration and reliability issues associated with copper / low k interconnects. Prior to Novellus Systems, he was a member of the technical staff at Bell Laboratories, Murray Hill for seven years. He received his PhD in 1991 from the University of Illinois, Urbana-Champaign and was a Research Associate in the Physics Department of Michigan State University for two years. He has published over 60 papers in refereed journals and has received 22 US patents. Jessica Rosenthal joined the Soliculture team in July 2016. Her background is in biochemistry (MS) and materials engineering (MS) with an emphasis on renewable energy. Jessica’s expertise lie in the fields of composite materials and nanotechnology in which her most recent projects focused on carbon nanotube water filtration membranes and fiberglass composites for use in wind turbines. Her previous experience includes positions as a Professor of Chemistry and a Laboratory Instructor of Materials Engineering. She is a great surfer. Ingrid Anderson, PhD, joined the Soliculture team in May 2014. Prior to Soliculture, Ingrid pursued doctoral and postdoctoral study of thin film and novel solar cell architectures and materials. Ingrid is an expert in materials characterization with SEM, TEM, FTIR, Raman spectroscopy, XRD, and a variety of other techniques, and manages Soliculture’s reliability testing and technology development. She has worked at several institutions, including the University of California-Santa Cruz, Colorado School of Mines, the National Renewable Energy Laboratory, and Los Alamos National Lab, both in an academic capacity and with industry startups. Ingrid enjoys the puzzle of developing new technologies within the confined phase space of making a real product. As Soliculture’s COO, Melissa has successfully driven the effort of bringing LUMO from a laboratory concept to a commercially available product. Melissa joined Soliculture during its inception in 2013 and has since managed their growing international supply chain, helped raise over $1M in funding, and taken a leadership role in the company. Prior to working with Soliculture, Melissa was a researcher in the Carter Applied Physics Laboratory at the University of California, Santa Cruz. 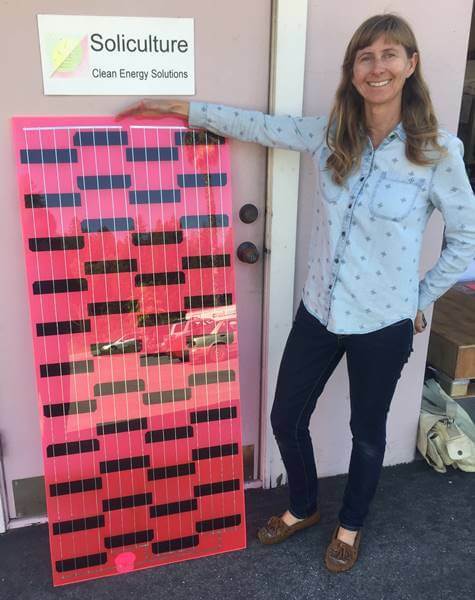 In 2015, Melissa received her Master of Science degree in Green Technologies Engineering from San Jose State University. She received her Bachelor of Science degree in Applied Physics from the University of California, Santa Cruz in 2012.